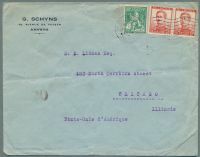 Description: US #65 on cover postmarked NEWBERN, N.C., MAR 31 with matching "US" fancy cancel sent to Rix, Mich. Description: US #24 on embossed decorative THOUGH ABSENT NOT FORGOTTEN local drop rate cover postmarked DELAWARE, O with original letter. 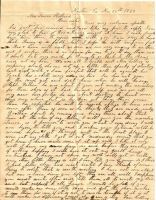 Description: Stampless folded letter postmarked CHARLESTON, S.C., JUN 23 with matching "25" in red sent to Providence, RI. Description: CSA #12 on cover postmarked AUGUSTA, Ga., JUL sent to Charlotte, NC. 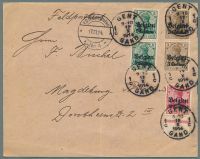 Description: CSA #11 on cover postmarked WILMINGTON, N.C., 5 PAID sent to Fair Bluff, NC. Postmark is an altered prewar 3 cent PAID device. Description: CSA #11 on cover postmarked KINGSTON, NC sent to Greensboro, NC. 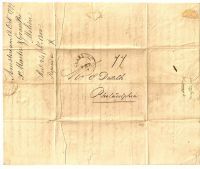 Description: CSA stampless cover postmarked NORFOLK Va., SEP 24, 1861 with matching PAID in circle and "5" rate sent to Woodville, NC. 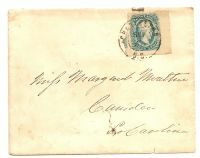 Description: CSA stampless cover postmarked CHARLESTON, S.C., JUL 15, 1863 with matching PAID 10 in circle sent to Columbia, SC. Description: CSA stampless cover postmarked CHARLESTON, S.C., SEP 16, 1861 with matching PAID 5 in circle sent to Pendleton, SC. Description: CSA #11 on cover postmarked CHARLESTON, S.C., OCT 14, 1863 sent to "Clay Mail", Edge Hill P.O., King George County, Virginia. Description: CSA #11 on cover postmarked CHARLESTON, S.C., MAY 6, 1864 sent to Strawberry Ferry, St. John's, Berkeley (Parish, SC ) via Charleston. Description: CSA #12 on cover postmarked CHARLESTON, S.C., DEC 29, 1863 sent to McIntosh Station No.3 Gulf Road, Liberty County, Georgia. Description: CSA #11 on cover postmarked CHARLESTON, S.C., SEP 9, 1863 sent to Miss Margaret Moultrie, Camden, SC.